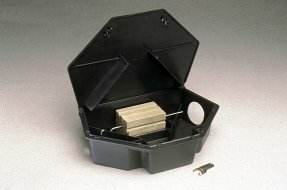 PROTECTA LP "Tamper Resistant" Rat Size Bait Station - This low profile triangular station fits in tight baiting areas, as well as in corners and along walls, either upright or on its side. A 2-prong key to used to open the lid. Comes with horizontal or vertical rods to hold block bait in place.